With two notable exceptions (Trevor Noah's Born A Crime and Dane Huckelbridge’s Castle of Water) for the past couple of years I have only been reading books by women authors. And after being blown away by Yaa Gyasi’s stunning Homegoing, and while currently devouring Min Jin Lee’s Pachinko, I realized that all I really want to read right now is novels by women of color. Why? Because just through Homegoing and Pachinko alone, I have developed a deeper sense of the massively different scope of human experience in different cultures and I feel that continuing to learn -- even through fiction -- is crucial. 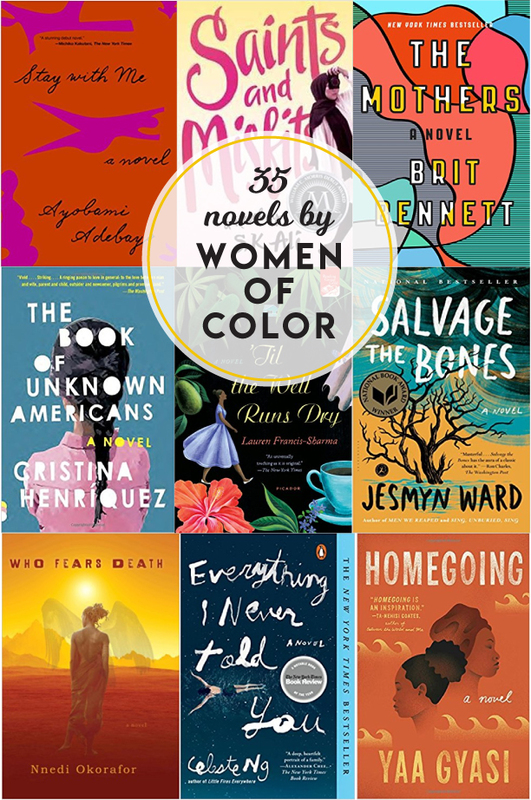 I recently put out a call for favorite novels by women of color and am so grateful to my smart friends (especially Thien-Kim Lam for providing a ton of recommendations!) for weighing in. Here are 35 novels by women of color. I am basically going to be working my way through this list through the remainder of this year! For some reason the Internet is being grumpy and not showing that the below titles are linked, but they are! Just click on the title and you can see the title on Amazon! Disclosure: Amazon affiliate links are included above so if you shop these links you'll support this site at no extra cost to you (thank you!). However, the list is also intentionally arranged alphabetically by author surname so it's easy for you to browse the stacks at your local library. Yay for libraries!